Senator Dino Melaye representing Kogi West senatorial district at the National Assembly is leading Senator Smart Adeyemi according to the result from INEC office in Lokoja. Out of seven local government councils, Melaye won six local government councils. Melaye is contesting under the platform of the Peoples Democratic Party (PDP) while Senator Adeyemi is contesting under the platform of the All Progressive Congress (APC). Both of them are from Ijumu local government council. While Senator Smart Adeyemi is from Iyara in Ijumu, Senator Dino Melaye is from Ayetoro-Gbede also in Ijumu local government council. In Kabba-Bunu LGA, Senator Smart Adeyemi of APC scored 8971 while Melaye of PDP scored 14756. In Kogi local government council, PDP scored 11024 while APC scored 15639; in Ijumu, PDP scored 11749 while APC 8517. In Lokoja local government, PDP scored 24576 while APC 18800. In Yagba West, PDP scored 8942 while APC scored 6799. Also, in Mopa, scored PDP 5112 while APC scored 3668. In Yagba East, PDP scored 8638 while APC 5077. Adeyemi scored a total votes of 67, 471 while Senator Melaye scored 84, 797. Mr Dennis Idahosa, candidate of the All Progressives Congress (APC), has been declared winner of the Ovia Federal Constituency in Edo State. Idahosa, a former Commissioner in Edo, polled a total of 28,509 to defeat the incumbent Ms Omosede Igbinedion, daughter Chief Gabriel Igbinedion who scored 23, 345 votes. 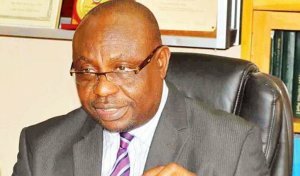 The Independent National Electoral Commission (INEC) returning officer, Prof. Victor Igbinedion of the University of Benin, announced the final result at Iguobazuwa, headquarters of Ovia South West Local Government Area. He said “Having polled the highest number of votes cast, Idahosa of the APC has certified all electoral conditions, and is returned elected as the winner of the Ovia Federal Constituency seat elections conducted on Saturday”. He further said that the people of the constituency had clearly shown, with their votes, that the mandate to liberate the federal constituency is sacrosanct. Idahosa stressed that never again would one single individual decideswho and what becomes what in the constituency. While promising to entrench good representation, he promised to remain magnanimous in victory. “It is in this light that I enjoin all the good people of Ovia, both those who supported me and those who worked against me, my opponents and the APC aspirants, who I contested the party’s ticket with, to work with me for the betterment of the constituency. “This election was not all about Dennis Idahosa, but the people, who have yearned for a better and effective representation this past years,” he stated. The APC candidate won 18 of the 23 wards in the constituency, while the PDP candidate won five. Further breakdown of the result showed that the APC candidate won in 9 of the 13 wards available in Ovia North East Local Government Area, and 9 in the 10 in Ovia South West Local Government. Similarly, his opponent, Omosede Igbinedion of the PDP, won four and one wards in Ovia North East and Ovia South West Local Government Areas respectively. The candidate of the All Progressives Congress (APC), Ajibola Bashiru, has been declared winner of Osun Central Senatorial election. Bashiru was declared winner by the Returning Officer, Titilayo Adelaje, a professor at Obafemi Awolowo University on Sunday night. The APC candidate had 132,821 votes against his arch rival, Ganiyu Olaoluwa of the Peoples Democratic Party PDP, who polled 106,779 votes. Mr Bashiru served as the Comissoner for Regional Integration in the first term of former Governor Rauf Aregbesola and later served as Attorney General and Commissioner for Justice in the second tenure of the same government. Result of the National Assembly elections for Katsina North senatorial district and Daura/Sandamu/Mai Adua Federal Constituency have been announced by the Independent National Electoral Commission (INEC) Returning Officer, Prof. Ojonigu Friday. He declared that Mohammed scored 94730 votes to defeat the PDP candidate Usman Tela who scored 25114 votes. According to him, total votes cast in the election was 123179. Number of rejected votes stood at 8329. The candidate of the All Progressives Congress (APC), Mr. Lola Ashiru, was on Sunday night declared the winner of the Kwara South Senatorial District election held on Saturday. The Returning Officer for the election, Prof. Sylvia Malom, while declaring the result at the Irepodun Local Government Secretariat in Omu-Aran, said Ashiru polled 89, 704 to emerge winner. Sen. Rafiu Ibrahim, the Peoples Democratic Party (PDP) candidate, who was Ashiru’s closest rival in the election, polled 45, 176 votes. Malomo said Ashiru having scored the highest number of votes in the election was declared winner and returned elected. Senate President Bukola Saraki has lost Kwara Central Senatorial Seat to the candidate of the All Progressives Congress, Dr. Yahaya Oloriegbe. In the latest result announced by the INEC collation officer on Sunday night, Saraki polled 30,075 votes against Oloriegbe’s 51,531 votes in Ilorin West local government area, the last of the four local government results announced. The APC candidate defeated the Senate President in all the four local governments in Kwara Central senatorial district. In Ilorin South Local Government, Oloriegbe polled 26,331 votes while Saraki polled 13,031votes. In Asa local government area, APC scored 15,932 votes while PDP got 11,252. The election result for Ilorin East local government council declared by the INEC collation officer, Professor Mufutau Ijaya, showed that APC polled 30,014 votes while PDP got 14,654 votes. President Muhammadu Buhari, the presidential candidate of the All Progressives Congress (APC), has won in the polling unit of Sen. Godswill Akpabio in Akwa Ibom. Akpabio, a former Peoples Democratic Party (PDP) governor of Akwa Ibom and former senate Minority Leader, defected to the APC and is currently the APC senatorial candidate for Akwa Ibom North West. Buhari got 1553 votes to win his closest opponent in the PDP, Alhaji Atiku Abubakar, who polled 11 votes in Ukana West 2, unit 9, Essien Udim Local Government Area in Akwa Ibom, Akpabio’s unit. In the senatorial election result, Akpabio won in the unit with 1533 votes while the PDP senatorial candidate, Chris Ekpenyong got 4 votes. Speaking after the declaration of the result, Akpabio commended INEC and security agencies for conducting a peaceful election in the state. He blamed the PDP for election rigging in the state, saying that was why 400 thugs were recently arrested by security operatives. Akpabio said PDP was now jittery knowing that security operatives had risen to their responsibility, saying three trucks of thugs imported to the state were apprehended. “When I was a governor I gave respect to the people. I did not use thugs. I am a lawmaker and will never allow myself in anything that will disrupt Buhari’s administration. The Borno State Governor Kashim Shettima has delivered to President Muhammadu Buhari, his Alhaji Kukawa 023 polling unit in Lamisula ward of Maiduguri to the All Progressives Congress (APC). President Buhari of the APC scored 190 votes, while Atiku Abubakar of the Peoples Democratic Party (PDP) got 21 votes. For Borno Central Senatorial district, which Governor Shettima is contesting, his party, the APC, scored 177 votes, while his opponent, Senator Mohammed Abba Aji of the PDP, polled 21 votes. For the House of Representatives, APC’s candidate, AbdulKadir Rahis, scored 177, while PDP’s candidate, AbdulSalam Kachallah, scored 30 votes. The Deputy Governor of the state, Usman Durkwa, was also able to deliver his polling unit at Bakin Kasuwa, Shaffa town in Hawul Local Government Area to President Buhari who polled 288 votes, while Atiku of the PDP scored only two votes. Unfortunately, the PDP senatorial candidate, Borno South, Mr. Kudla Satumari, scored 240 votes to defeat the incumbent on the platform of the ruling APC, Senator Mohammed Ali Ndume, former Senate Majority leader. The APC candidate for Askira Uba/Hawul Federal Constituency, Dr. Haruna Mshelia polled 207 votes, while his rival from the opposition PDP, Emmanuel Bassi, scored 81 votes. Peoples Democratic Party (PDP) presidential candidate, Alhaji Atiku Abubakar, Saturday defeated President Muhammadu Buhari in the overall Presidential Villa polling units’ presidential election results. Atiku polled a total of 1,030 votes to defeat Buhari who scored a total of 1,013 votes with 13 votes difference. In the same vein, the PDP defeated the APC in the overall senatorial election results with a total of 1,081 votes as against 1,008 scored by the APC in the two polling units. The opposition PDP also defeated the APC in the House of Representatives’ election with 1,046 votes to APC’s 995 votes. In the two polling units in the Presidential Villa, Atiku defeated Buhari in polling unit 022 with 525 votes to the president’s 465 while Buhari defeated him in polling unit 021 with 548 to 505 votes, thus bringing the total votes for Atiku to 1,030 while Buhari’s total votes stood at 1,013 with 17 votes difference. On the other hand, the total votes scored by the PDP at the senatorial election in unit 021 is 535 as against APC’s 531 with only four votes difference while in polling unit 022, PDP scored 546 votes to defeat APC which scored 477 votes, thus bringing the total PDP senatorial votes to 1,081 as against APC’s 1008 with 73 votes difference. At the House of Representatives’ election, whereas APC polled 531 votes as against PDP’s 525 in polling unit 021, the opposition party polled 521 votes to defeat APC with 466 votes in unit 022, thus bringing the total PDP votes in House of Representatives’ election to 1,046 as against APC’s 995 votes with 51 votes difference. Below is the breakdown of the results of the presidential, senatorial and House of Representatives’ elections in each polling units. The All Progressives Congress (APC) has continued to spring surprises in Saturday’s general elections, winning the Senatorial and Presidential polls in unit 004 Hinderea Road, Liverpool area, Apapa Lagos. The News Agency of Nigeria (NAN) reports that the governorship candidate of the Peoples Democratic Party (PDP) in Lagos, Mr Jimi Agbaje, voted at the polling unit. Announcing the results after delays in sorting the votes, the Polling Officer, Mr Omolain Ehichioya, said the APC polled 83 votes in the presidential election at the unit while PDP got 80 votes. He said the Young Democratic Party (YPP) , the Social Democratic Party (SDP), the African Democratic Party (ADP), African Action Congress (AAC), Alliance for Peoples Agenda (APA) and Yes Electorate Solidarity (YES) party got one vote each. In the Senatorial results, the APC got 88 votes, the PDP 79 while Zenith Labour Party (ZLP) and People’s Trust (PT) got one vote each. However, the PDP got the highest vote of 84 in the House of Representatives results, followed closely by APC with 74 votes and Zenith Labour Party (ZLP) with eight votes. Abundant Renewal Nigeria Party (ANRP) recorded two votes while Alliance for New Nigeria (ANN) got one vote. Senate President Bukola Saraki Saturday delivered his polling unit, Ode-Opobiyi unit to the Peoples Democratic Party(PDP) in the Presidential and National Assembly elections on Saturday. In the result counted last night in Ilorin at the polling unit 005, Agbaji quarters, I Ajikobi ward in Ilorin West local government council area of the state, Saraki’s party, PDP polled 129 votes against 68 votes of APC in the presidential result. Also in the two other results from the Ode-Opobiyi polling unit 006, PDP polled 234 as against 152 of APC in the presidential election. In the Senate result, PDP polled 270 as against 120 APC votes while in the House of Reps result, PDP polled 269, APC 130 votes. At the polling unit 021 of the Ode-Opobiyi in Agbaji quarters, Senatorial result showed PDP polled 167 and APC 57. In the House of Reps, PDP polled 164, APC 63 while in the presidential result released, PDP polled 156 and APC polled 67 votes. The Department of State Services (DSS) has announced the dismissal of one of its staff, Otelemaba Jaja, said to be involved in bribe taking from motorists during the performance of election duties in Ekiti State. According to a statement by the Services’ Spokesperson, Peter Afunanya, a picture of Jaja had surfaced on the Social media wherein he was presented as negotiating with a motorist for financial patronage. Afunanya said immediately the news broke, the Service initiated a line of investigative actions. “These include the search and identification of the said Officer; his withdrawal from the duty post and issuance of a Memo as applicable to his cadre and rank. “In line with the Service’s disciplinary procedures, Jaja was tried in an Orderly Room and summarily dismissed. The Service’s staff are already aware how serious it abhors offences against discipline and that it is no respecter of persons and ranks. “Jaja instant dismissal is in accordance with the DGSS’ avowed commitment to, among others, promote discipline in the Service. It may be noted that the DGSS’ stance on issues concerning discipline has continued to prove his intolerance for misconduct and discreditable behaviour”, he said. Afunanya, while stressing that the Service condemns, in its entirety, the infamous act of the dismissed staff, urged the public to note that Jaja is no longer a member of the DSS. He however, reaffirmed the commitment of the DSS to professionalism, excellence and the rule of law, adding that the DSS, as usual, rededicates itself to the security of the ongoing electoral exercise and reassures the nation of its sustained transparency and accountability in dealing with citizens. Results released by the presiding officer of Hassan Manzo polling unit in Herwagana ward of Gombe metropolis of Gombe State, Ahmed Jamilu Makko, has shown that PDP presidential candidate, Atiku Abubakar, failed to win substantial votes during Saturday’s election as he polled only 80 votes against his rival, President Muhammadu Buhari, who polled 457 votes. Governor Ibrahim Hassan Dankwambo, a PDP governor, however won in the polling unit with 325 votes against his main rival, Saidu Ahmed Alkali of the APC, who polled 212 amidst jubilation by APC supporters who sang as they escorted the result to the collation centre. The election in Gombe was generally peaceful in most parts of Gombe North Senatorial district where our correspondent monitored the election. Election started on time as many voters lined up even before the arrival of election officials. As at the time of filing this report, Gombe, the Gombe State capital was generally peaceful and calm as attention was shifted to the collation centres across the state. A soldier and five other persons were killed while several others sustained injuries in the violence that trailed the Presidential and National Assembly elections in Rivers State. The soldier, a lieutenant, was among persons said to have been killed at Abonnema, headquarters of Akuku Toru Local Government Area, while a chieftain of the All Progressives Congress (APC) and former Chairman of Andoni Local Government Council, Chief Mowan Etete, was killed alongside his elder brother and cousin in Asarama. In a statement issued by its Publicity Secretary Chris Finebone, APC said one of its ex-officio members of State Executive Committee, Ignatius, was also shot dead at Ajakaja, also in Andoni by suspected thugs. Also, an unconfirmed number of persons believed to be members of the Peoples Democratic Party (PDP) were killed following the eruption of violence before the commencement of accreditation and voting in Asari-Toru, Akuku-Toru and Degema Local Government Areas of the state. The police however have confirmed the death of the soldier and two others, while the army was yet to react to the death of the soldier as at the time of going to press. The state Police Public Relations Officer (PPRO), Nnamdi Omoni (DSP), while confirming the incidents, said Etete was in his house when unknown gunmen scaled the fence, entered the house and killed him and his brother. “We had issues in Okrika and in Andoni. In Andoni, two lives were lost as a former local government chairman and his brother were shot dead. In other places, we had pockets of crisis. The men on the ground have been able to restore normalcy in these areas. “The Commissioner of Police has ordered investigation into these matters. We already have a task force on electoral offences. The task force is headed by the Deputy Commissioner of Police and arrests have been made in all the cases and persons arrested are helping us. “I am not aware of such a report that a soldier was killed. We heard about shooting in that area, but nobody has told us about any casualty in that area (Abonnema),” he said. Areas worst hit by violence were communities in Eleme, Ikwerre, Bonny, Asari-Toru, Akuku-Toru, Degema, Andoni and Okrika. Despite the presence of heavily armed security agents drawn from the Department of State (DSS), the Nigerian Army, the Nigeria Police, the Nigerian Security and Civil Defence Corps (NSCDC) and several others, shootings and explosions rocked parts of the state. Meanwhile, INEC has announced the suspension of elections in Bonny and Akuku Toru Local Government Areas of Rivers State. The Resident Electoral Commissioner (REC), Obi Effanga, told THISDAY that the commission had to suspend elections in the two areas because of security concerns. “We are reviewing the situation and will fix a new date when we will conclude elections in those areas,” he said. The violence put a damp on the massive turnout of voters in the state despite the late arrival of materials. While voters turned out as early as 7.30am in some polling stations, materials did not arrive many stations until as late as 10am. 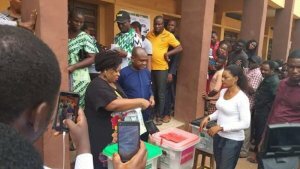 Also, the Minister of Transportation Chibuike Amaechi and his wife, Dame Judith Amaechi, voted at Unit 8, Ward 14, Ubima in Ikwerre Local Government Area of the state at about 10am. Addressing journalists after casting his vote, Wike expressed happiness with the large turnout of voters. He stated that Nigerians are ready to exercise their franchise. He said that INEC showed preparedness in the discharge of their electoral duties during the voting process, regretting that the military proved to be the stumbling blocks against democracy across the state. Wike said: “It is unfortunate that our military can descend so low. We used to complain about the police, but now it is the military. Similarly, the Chairman of Ikwerre Local Government Area of the state, Hon. Samuel Nwanosike, has called on the international community and Nigerians to prevail on Amaechi not to change the outcome of the Presidential and National Assembly elections in the area. Amaechi, who is also the Director-General of President Buhari Re-election Campaign Organisation, hails from Ubima community in Ikwerre Local Government Area of the state. Nwanosike said: “In Ikwerre Local Government Area, we are law abiding people. Since 2015 when we started having proper election, because you know that we have had what is called nearest to one-party system in Rivers State since 1998/1999 to 2015. “In 2015 general election, once accreditation and voting had started in the morning, the exercise will be peaceful until afternoon, violence will start immediately the collation starts at the ward level. That is where crisis will start and that is the problem we have here. “Who is causing this crisis? Just one man, Rt. Hon. Chibuike Rotimi Amaechi, the Minister of Transportation under the Buhari government. We keep complaining on this same issue. It happened in the rerun we had in March 16, 2016. On December 10, 2016, during the re-rerun it happened. The Peoples Democratic Party (PDP) has described the day as a “black day” in Rivers politics. The state PDP Director of Information and Communications, Emma Okah, in a statement, described the situation as “barbaric and appalling, coming after the people of Rivers State had complained aloud about the threats of rigging, intimidation and violence hanging over their heads”. “It is a black day in Rivers State as the Presidential and National Assembly elections turn bloody with many PDP members shot dead by the military in Akuku Toru Local Government Area,” he said. He said reports from other parts of the state showed a pattern of organised violence and shootings in some cases with the military, police and APC as the main actors. THE ALL PROGRESSIVES CONGRESS (APC) WON THE KADUNA STATE GOVERNOR, MALLAM NASIR EL-RUFAI’S POLLING UNIT BY THRASHING THE PEOPLES DEMOCRATIC PARTY (PDP) WITH 371 VOTES TO 44 VOTES. BUT SENATOR SHEHU SANI REPRESENTING KADUNA CENTRAL SENATORIAL ZONE, WHO DEFECTED FROM THE APC TO THE PEOPLES REDEMPTION PARTY (PRP) TO SEEK RE-ELECTION LOST IN HIS POLLING UNIT IN ANGUWAN SARKI. SANI POLLED 51 VOTES, WHILE HIS OPPONENT, UBA SANI OF THE APC SCORED 236 VOTES. THE PDP RECEIVED 34 VOTES. KADUNA 015, KATURU/YOBE POLLING UNIT. The Head of Mission, European Union (EU) observers, Maria Arena, has noted that there was late arrival of election materials and officials of the Independent National Electoral Commission (INEC) in some polling units she visited. Though Arena, who addressed journalists at the Garki Post Office 018 polling unit, Abuja, said the EU observers were not prepared to comment on the general processes of the election, she noted that women participated more prominently in the process. “We are not here to give any impression. We are European Observation Mission and we are working on a methodology for a long observation mission. We have been here since January. So, I am not here to give my own impression or personal observation. What we can say is the collective information coming from all over the country. “We have seen that a lot of polling units were opened later than 8 o’clock in the morning. At least we can say that for the moment. We will have a preliminary report on February 25. We will have all the information at that time. “Now, we are collecting information and we don’t want to give our impression now. What is important is that we have this election today. It is important for Nigerians. We have seen a lot of Nigerians being happy to be there to vote and to have the opportunity to vote for their country. And we have to give this message to Nigerian people to go and vote for their country,” she said. Meanwhile, the lawmaker representing Suleja federal constituency, Niger State has expressed satisfaction over the prompt response of INEC to the issue of faulty card readers in his constituency. 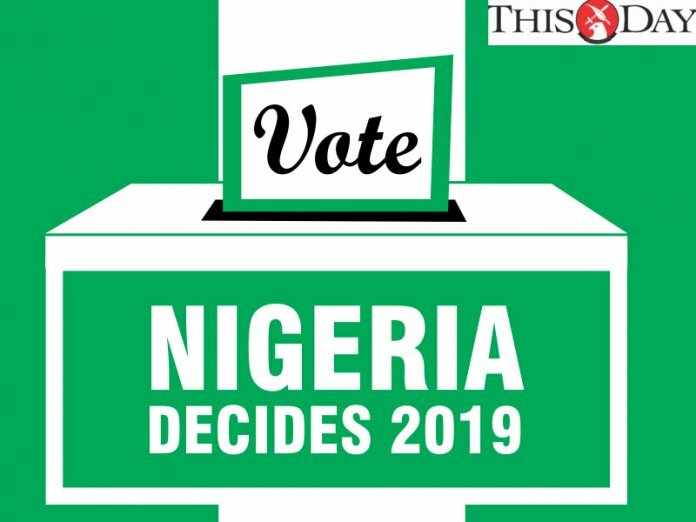 Also speaking on the conduct of the election, the lawmaker, who spoke with THISDAY after casting his vote at his Hashmi 1 polling unit in Suleja said: “The election is very free, fair and violence-free. Actually, some of the card readers are faulty but it is not much. We appreciate the response of INEC because they came on time. The response time from INEC was very good. Another member of the House of Representatives representing Kuje/Gwagwalada/Kwali/Abaji federal constituency, who is the candidate of the All Progressives Congress (APC), Hon. Zakari Angulu, said INEC did a good job in the Saturday presidential and National Assembly elections. 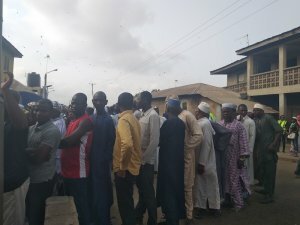 The Ogun State governorship candidate of the All Progressives Congress (APC), Prince Dapo Abiodun, has failed to deliver his polling unit for the party’s presidential candidate, President Muhammadu Buhari, as the presidential candidate of the Peoples Democratic Party (PDP), Alhaji Abubakar Atiku, won. At ward 03, polling unit 2, Ita-Osanyin, Iperu 1, Ikenne Local Government Area, the PDP presidential candidate, Atiku, scored 124 votes, while the APC presidential candidate, Buhari, polled 118. But Ogun State Governor, Sen Ibikunle Amosun, delivered the presidential election of his ward 6, polling unit 8, Ita-gbangba, Itoko, Abeokuta South Local Government Area, for the APC presidential candidate, President Muhammadu Buhari, who scored 50 votes to defeat the PDP candidate, Atiku, who polled 20 votes. President Muhammadu Buhari has defeated Waziri Adamawa and the Peoples Democratic Party (PDP) presidential candidate, Alhaji Atiku Abubakar, at Lamido Adamawa Palace polling unit in Yola South Local Government Area. The Boko Haram attack early Saturday morning on Geidam in Yobe State prevented the state Governor, Alhaji Ibrahim Geidam, from taking part in Saturday’s Presidential and National Assembly elections. Geidam, a border town to the governor’s hometown, Bukarti in Yunusari Local Government Area, fell to an early Boko Haram attack and its security situation prevented the governor from travelling. For the governor to get to his hometown to exercise his franchise, he had to pass through Geidam and he was advised by his security to forget about voting. Abdullahi Bego, the spokesman of the governor, confirmed the development to journalists in Damaturu. Bego, however, said the situation was under control and voting was going on in the governor’s hometown but added that the governor could not partake in the exercise. “The security agencies would naturally seek to reinforce and increase security around the governor for him to travel to cast his vote. “The increased security around the governor will mean that vital security resources that are needed elsewhere in the state would have to be diverted and allocated to the governor,” the governor’s spokeperson said. It was gathered that the governor, after consultation with security agencies decided that it was more prudent to make the sacrifice. “It is better and more useful for the security agents, including soldiers, police, civil defence, DSS, to focus their attention on providing security for the election than devoting large security contingent for the governor to cast his vote,” Bego said. Gaidam, who is also a senatorial candidate in the election, commended security agencies for their effort to ensure a peaceful and successful election across the state. Meanwhile, Alhaji MaiMala Buni, the All Progressives Congress (APC) gubernatorial candidate in Yobe, said adequate preparations by the Independent National Electoral Commission (INEC) and security agencies ensured the success of the elections in the state. 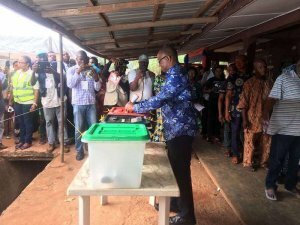 The gubernatorial candidate made the observation after casting his vote on Saturday in Damaturu. He said the timely commencement of the elections, adequate provision of election materials and security to the electorate made the election successful. “The massive turnout of voters was encouraged by the security apparatus put in place and the commitment to the preparations made by INEC. “The turnout is very impressive and the momentum should be maintained,” he said. It was an embarrassing outing for the presidential candidate of the Peoples Democratic Party, Alhaji Atiku Abubakar, in his polling unit in Adamawa State as his main opponent, President Muhammadu Buhari, who is the candidate of the All Progressives Congress scored the highest number of votes. The result of the presidential election in Atiku’s Ajiya 012 polling units showed that APC scored 186 as against PDP’s 167. APC also won the senatorial polls in the unit as the party scored 187, PDP, 120, and ADC 28. In the House of Representatives election in the polling unit, APC scored 145, PDP 121, while ADC got 63 votes. 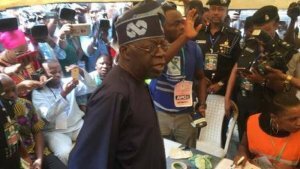 he National leader of All Progressives Congress (APC), Sen. Bola Tinubu, has won his Polling Unit 047, Ward 3, at Sunday Adigun, Alausa, in Ikeja, Lagos for President Muhammadu Buhari. In the poll results announced at the polling unit, APC polled 121 votes as against 53 polled by the PDP. In the Senatorial election, APC scored 134 votes to defeat PDP, which polled 46 votes. In the House Representatives election, APC got 124 votes while PDP scored 45 votes. No fewer than 2,685 Internally Displaced Persons (IDPs) from Batsari Local Government of Katsina State, who fled their ancestral homes following attacks by bandits, Saturday voted at their temporarily camp. The IDPs, who were sacked from their communities a fortnight ago, are currently taking refuge at Batsari Model Primary School. The displaced persons were 2,000 as at last Thursday but the Executive Secretary of the State Emergency Management Agency (SEMA), Babangida Nasamu, who visited the camp to ascertain the situation, said that the figure had risen to 2,685. An electoral officer, who preferred anonymity, told THISDAY in a telephone interview that the IDPs in the camp commenced accreditation and voting at 12:17p.m according to their polling units. “In a bid to avoid being disfranchised, INEC has provided ballot boxes and other election materials to the IDPs temporarily residing in Batsari Primary School to enable them cast their votes. “They were grouped into five different places. The number of people in this camp that will cast their votes today are more than 2,685. Although most of them don’t have PVCs because they misplaced them during the crisis,” he explained. However, turnout of voters in some parts of the state was impressive as eligible voters were seen in different polling units as early as 8am. In most of the polling units visited by THISDAY, accreditation and voting started simultaneously at about 8:15a.m. At Kofar Fada polling unit 001, in Dayi community, Malumfashi Local Government Area, voting started at 8:45am and it was the same situation at Unganku Polling Unit 19 and 007. 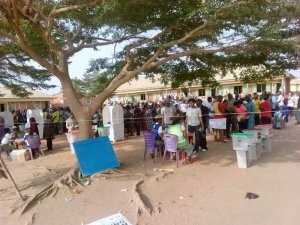 While at Kafur/Masari electoral ward, polling units 001, 002, 003 and 004, in Kafur Local Government voters in their thousands were seen casting their votes. At Musawa, Mutazu, Charanchi and Kankia Local Government Areas of the state the electorate conducted themselves in a peaceful manner during the polls. Governor Aminu Bello Masari, who cast his vote in his hometown, Kafur, polling unit 001, applauded the Independent National Electoral Commission (INEC) for conducting the elections and expressed optimism that the election would be free and fair. He said the All Progressives Congress (APC) needed a transparent and credible elections across the country, urging the election umpire to remain neutral in its electioneering processing. The governor cast his vote at about 10:45am in company with security agents and other government officials within the area. President Muhmadu Buhari of the All Progressives Congress (APC) has scored the highest number of votes cast at his Polling Unit 003, Sarkin Yara A with a combined number of 523 votes, while his main opponent Alhaji Abubakar Atiku of the Peoples Democratic Party (PDP) recorded three votes. The Polling Unit which is split into two; A and B, had Buhari scoring 302 votes in the A section of the Polling Unit where he voted. Mr. Atiku had three votes. While four votes was recorded for Accord Party, though it had adopted Buhari as its presidential candidate. In the B segment of the Polling Unit, Buhari went ahead with 222 votes ehile Abubakar scored 0. The result at Polling Unit 003 A was announced by the Presiding Officer, Mr. Ali Abdullahi, a serving member of the National Youth Service Corps, while Mr. Yusuf Armah presided over segment B of the Polling Unit. 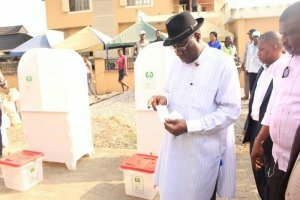 There were reports of hijacking of electoral materials from seven wards at Bassambiri and Oluasiri in Nembe Local Government Area, the Bayelsa State Deputy Governor John Jonah’s hometown on Saturday. Several women also besieged the office of the Independent National Electoral Commission (INEC) to protest the disappearance of materials meant for Opu Nembe and Oluasiri by suspected thugs who used a surveillance contractor’s platform in the area. 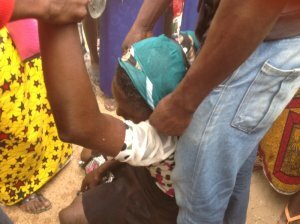 The women, who demanded the release of the electoral materials, are from seven wards of Bassambiri and Oluasiri, Nembe Local Government Area. It was learnt that the materials for Nembe Constituency 2 and 3 comprising Opunembe and Oluasiri were hijacked and taken to Darius Hotel in Bassambiri. The Nembe Local Government Chairman, Mr. Sunny Erewari, said that the women were protesting because they could not vote in spite of the fact that they all had their permanent voters cards(PVCs). 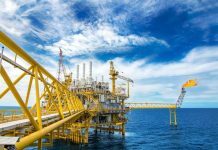 The local government agent for the Peoples Democratic Party (PDP), Mr Jonathan Obuebite, said that elections did not hold in Nembe and Bassambiri and called for the cancellation of the exercise there. He said that while the security agents were doing their best to prevent total breakdown of law and order, a certain army lieutenant accompanied some thugs to perpetrate the mayhem in Nembe. The Oyo South Senatorial District candidate of the All Progressives Congress (APC), Governor Abiola Ajimobi of Oyo State, has expressed satisfaction with the conduct of Saturday’s election, describing it as credible, peaceful and relatively hitch-free. Ajimobi, who is the All Progressives Congress (APC) candidate for Oyo South senatorial district, said this while speaking with journalists shortly after casting his vote in company with his wife, Mrs Florence Ajimobi, children and sons-in-law at Ward 11, Unit 20, Oluyole Community Grammar School, Oluyole Extension, Ibadan. The governor said the election was the best he had witnessed since he joined politics. According to him, the conduct of the election was a marked improvement from the past exercises, apart from reported cases of late arrival of polling materials in few polling units across the state. He said he was particularly impressed by the large turnout of voters, especially youths whom he said had, by their actions on Saturday, demonstrated their resolve to assume leadership positions. He said: “I’m impressed with the conduct of today’s election which I can confidently say passes the litmus test of freeness, fairness and credibility. I congratulate the people of Oyo State for turning out in large numbers to exercise their franchise. “The atmosphere in this polling unit is that of conviviality. We are all laughing and smiling at one another. The faces I see here are the faces of people who are happy and satisfied with this election. “From what I have seen here and the reports I have received so far, the election is hugely successful and credible. The few cases of late arrival of electoral materials were later resolved. “Not minding whether they are voting for our party or not, the voters here received me and my family warmly and you can see all of us throwing banter. I must tell you, this is another achievement of our administration. I did not hear any case of brigandage or violence so far. He however enjoined the people of the state to maintain the orderliness, peaceful conduct and large turnout in the March 9 gubernatorial and House of Assembly elections. The Independent National Electoral Commission has announced the suspension of elections in Bonny and Akuku Toru Local Government Areas of Rivers state. The Resident Electoral Commissioner, Obi Effanga, told THISDAY that the commission had to suspend elections in the two areas because of security concerns. There had been heavy shootings in Abonnema, headquarters of Akuku Toru as well as in Bonny. The casualty figured are yet to determined. Some of the electorate who are familiar with her said the woman had been sick for quite some time. Mr Samuel Adamu told NAN that the woman had not been feeling well. Violence has erupted in parts of Rivers State in the ongoing presidential and National Assembly election. The All Progressives Congress (APC) has alleged that one of its chieftains and former chairman of Andoni Local Government Area of the state, Chief Mowan Etete, was killed alongside his elder brother and also his cousin in Asarama. 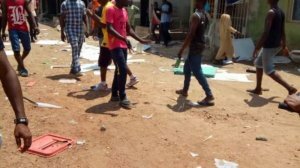 In a statement issued by its Publicity Secretary, Chris Finebone, the party also said one of its ex-officio members of the state Executive Committee, Ignatius, was also shot dead at Ajakaja, also in Andoni by suspected political thugs. The police have not confirmed the deaths yet. Heavy gunfire has also been reported at Abonema, headquarters of Akuku Toru Local Government Area of the state. No casualties have been reported but THISDAY gathered that many voters were scared away from polling stations. 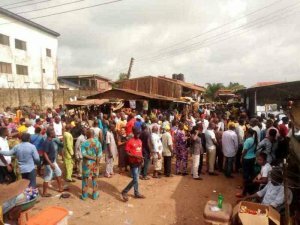 Voters are now stranded at Abagana Ward 4, polling unit 003 in Njikoka Local Government of Anambra State following the failure of the card reader. The voters, who spoke to THISDAY, expressed anger over their inability to cast their ballot. A House of Representatives candidate of APDA, Adam Akonanya told THISDAY that he and his people were at the polling unit earlier before 8am but were yet to do anything at 11am because of the failure of the card reader. before the card reader malfunctioned. “Since then our people have been here without any explanation. The INEC people are just saying we should exercise patience. Look at the time now voting will end at 2pm,” he said. The Ogun State Governor, Sen Ibikunle Amosun, faced a challenge at his ward where he wanted to cast his votes for both the Presidential and National Assembly elections when the card reader rejected his thumbprint. 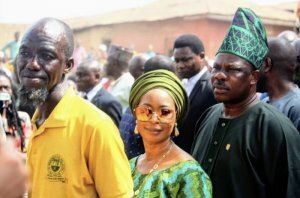 Amosun who, in company of his wife, Olufunsho, arrived at his polling unit 8, Ward 6, Ita-gbangba, Itoko, in Abeokuta South Local Government Area of the state, in an unmarked SUV, at 10:50.am was beset with the problem of casting his votes. When it was the turn of the governor to cast his vote at 12 noon, the card reader rejected his thumbprint until a technician came to his rescue and worked on the machine. However, the technician asked Amosun to wash his hand which later paid off, before he could vote. 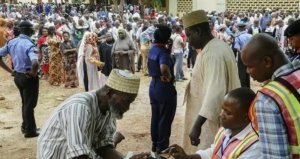 Eligible voters in Damaturu, Yobe, were on queue as early as 5.00 a.m and waited for the arrival of officials and commenced voting in the rescheduled presidential and parliamentary elections. A NAN correspondent who visited some polling units in the metropolis reports that election officials and materials were deployed to the polling units before 8 am, while the accreditation and voting process commenced at exactly 8.am. Some election officials who spoke to News Agency of Nigeria (NAN), said they had adequate materials as well as security personnel, and that the electorates were conducting themselves in orderly manner. Adama Abdullahi, Presiding Officer at Fire Service polling unit said voting commenced at exactly 8.00 a.m and that they had adequate materials. “Our only area of concern is the battery charger (for the card reader); we fear it may run down in the afternoon but we have complained to the supervisor and he has promised to provide us with a backup,” she said. Similarly, election in Mairi, Pompomari, Central Primary School and Water Board polling units all commenced at the scheduled time. Hajiya Zara Bukar, a voter, said she joined the queue very early to exercise her franchise. “I have voted the candidates of my choice peacefully and everything is going on as planned,” she said. The Anambra State Governor, Chief Willie Obiano, has cast his vote in the presidential and National Assembly election in his community, Aguleri, Anambra East Local Government Area. He said he was confident that more voters would arrive at the polling unit to cast their votes. He called on people with voter cards to come out en masse to exercise their civic responsibility or be disenfranchised. Obiano’s ward, Aguleri ward 1, was however without the usual crowd that comes out during voting exercise. But the governor, who came out to vote at 10:15am in company with his wife, said the low voter turnout was not anything to worry about, adding that the voters whose polling booth was there were living close by and will come out to vote before the close of the voting exercise. Governor Ifeanyi Ugwuanyi of Enugu State and the Deputy Senate President Ike Ekweremadu have described the large turout of voters as encouraging, saying the process was calm, peaceful and orderly. On his part, Ekweremadu, who is also the Peoples Democratic Party (PDP) candidate for Enugu West senatorial zone, expressed delight with the smooth process as at the time he cast his vote at 10.25am at his Mpu polling unit in Aninri Local Government. He however regretted that voting was yet to start in some of the polling units, citing network-related challenges with the card readers, incomplete ballot papers in some units and complete lack of ballot papers in other areas. He said that at Umuabi in Udi council, result sheets which were formally missing were found in the bush. He expressed satisfaction with the security situation at the polls. “So far, we can see that the people are orderly and everywhere is calm. We hope to have a trouble free polls,” he said. Checks by THISDAY showed that there was heavy security presence across the 17 councils in the state. Journalists and election monitors’ vehicles were thoroughly searched by soldiers. Security is very tight with roadblocks mounted on major highways and interstate roads. A former President of the Senate, Senator David Mark, has said that peaceful conduct of election is possible in Nigeria if politicians and relevant authorities comply with the rules of the game. Mark enjoined the security operatives and the Independent National Electoral Commission (INEC) to carry out their assignments creditably without fear or favour, saying that the interest of Nigeria must be paramount at all times. He however told the electoral umpire to be conscious of any lapses or shortcomings in the current exercise with a view to correcting them in the forthcoming polls. Mark believes that politics is a noble job to render service to the people and not otherwise. The Acting Inspector General of Police, Mohammed Adamu, has embarked on visits to Polling Units across the Federal Capital Territory (FCT), Abuja to assess the security situation in and around the various voting centers in the capital. Adamu in a convoy of some security chiefs and journalists arrived at ward 002 in Garki Model Primary School in Garki Village, by Da’a Social Club. As about 12.15pm when he arrived the center, voting was ongoing in an orderly and peaceful manner. While some voters were seen casting their votes, others were still undergoing accreditation. Officials however told the IG everything had been orderly and peaceful so far. 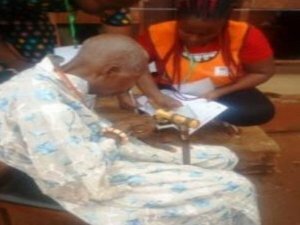 Voting started peacefully and early in most parts of Ondo State as the electorate trooped out in large numbers to exercise their rights in the presidential and National Assembly elections. Areas monitored in the state showed that voting materials got to units early enough except in some few places at Owo town. When THISDAY got to Methodist Primary School, which is the collation centre for Ward 5, ad hoc workers mostly corps members were still waiting to be moved to their units as at 8:30am. 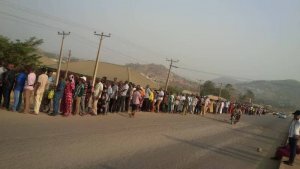 As at 9:30am, voters were waiting anxiously at Emure Ile in Owo Local Government area. The anxiety of the people was noticed as they rushed towards the bus that conveyed journalists that came to cover the exercise thinking it was the bus that brought the materials. According to the governor, election in any democracy is a thing that can be either way, “there are so many ways it could go but whichever way it goes, we have to accept”. Meanwhile, there was a large turnout of voters in Akure North Local Government Area. At Igoba/Isinigbo Ward 5, the electorate trooped out to cast their votes. At Ijomu area in Akure South Local Government, a man, who was badly injured by suspected thugs, was seen being attended to by men of the Red Cross. Security operatives were seen at various junctions to ensure compliance with the restriction of movements. In areas visited, vote buying was not visible as people said money had been shared since the previous night and early on Saturday. Also, there were no incident of non functioning card readers in most places visited. 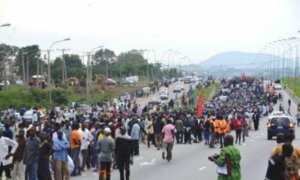 It was also gathered that security was tight in the riverine Ilaje and Ese Odo Local Government which were in Ondo South Senatorial District. Foreign observers that came to monitor election at 009 polling unit in Mararaba, on the outskirt of Abuja, have left after waiting for over two hours without any INEC staff in sight. Over 6,000 persons have gathered to cast their votes. The same situation has also been recorded at 008 polling unit which has over 10,000 voters who have been complaining about INEC officials’ inability to organise them properly after coming late at about 10:43am. At 010 unit in Mararaba, the INEC officials arrived at 10:44am. The turnout of voters for the presidential and National Assembly elections in Katsina State was impressive as people were seen eagerly waiting for the commencement of accreditation and voting. The voters, mostly women, were seen at the various polling units in Katsina Local Government Area as early as possible patiently waiting for the commencement of the exercise. Election materials, including sensitive and non-sensitive, have also arrived polling units in the state for the elections as early as 8am. There was also the presence of unarmed security personnel comprising officers of the Nigeria Police Force (NPF), and Nigerian Security and Civil Defence Corps (NSCDC). In most of the polling units visited by THISDAY, accreditation and voting commenced simultaneously as early as 8:15am as directed by the Independent National Electoral Commission (INEC). At Kofar Fada Unit 001, Dayi community, Malumfashi Local Government Area, accreditation and voting started at about 8:45am and it was the same situation at Unganku Polling Unit 19, and Dayi Primary school Unit 007. Governor Aminu Bello Masari, who cast his vote in his hometown, Kafur, polling unit 001, applauded INEC for holding the elections and described the process as successful and expressed optimism that the election would be free and fair. He said the All Progressives Congress (APC) needs transparent and credible elections across the country, urging the election umpire to remain neutral in its electioneering processing. The governor cast his vote at about 10:45 am in company with security agents and other government officials within the area. Meanwhile, as of press time, accreditation and voting were ongoing in some polling units. 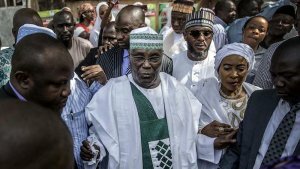 The presidential candidate of the Peoples Democratic Party (PDP), Alhaji Atiku Abubakar, has lauded the massive turnout of voters in the Saturday election. Abubakar, who spoke with newsmen after casting his vote at Ajiya 02 polling unit of Gwadabawa Ward, Yola North Local Government Area, said he was highly impressed by the turnout. “I am impressed with the turnout of the people and I hope that INEC officials will be able to cope with the crowd”. The Independent National Electoral Commission (INEC) in Kano State says it has dispatched its technical experts to some areas to rectify faulty card readers. The INEC Assistant Director, Public Affairs in Kano state, Garba Lawal-Mohammed, told the News Agency of Nigeria (NAN) on Saturday in Kano that the experts were deployed following complaints from the affected areas. “We have Election Monitoring Spot Centre where we monitor what is going on. So we are going to rectify the faulty card readers,” he said. The News Agency of Nigeria (NAN) reports that there were complaints from some of the polling centres across the state that some card readers were faulty. He gave assurance that the commission would address the challenges to enable all eligible voters exercise their franchise. “The commission has sent its technical experts to rectify the faulty card readers found in some places, “he said. Meanwhile, the election in Kano state was peaceful as there was no reports of any violence or breach of peace from across the state. There is large turnout of voters in Sabon-gari area of Fagge Local Government Area of Kano state with voting commencing before 9 am. The Supervising Presiding Officer of the Independent National Electoral Commission (lNEC), Malam Mohammed Kabir, said he slept at the centre to ensure early commencement. A voter, Mr Eze Collins, a painter said he was impressed with the massive turnout of people and their orderly conduct. “INEC officials coming early will allow everybody to vote without any stress,’’ he said. More than 50 members of the National Youth Service Corps (NYSC), said to be on ad hoc duty, are currently stranded at the National Independent Electoral Commission [INEC], Enugu State headquarters. A correspondent of the News Agency of Nigeria (NAN) reports that the corps members, who were seen looking distressed as some of them lay on the ground, had waited for hours for the INEC officials to address them. Few of them, who spoke on condition anonymity, said they were trained as ad hoc workers and were asked to report at the INEC headquarters, Enugu, for posting. They said since Friday when they arrived at the commission’s office till the time of filing this report on Saturday, nobody had addressed them on condition of their ad hoc service for the elections. “We are no longer finding the situation conducive, hence we might leave since we do not know our fate here,’’ they said. But a top INEC official, who also spoke on condition of anonymity, said, “We are working on instructions and directives from above. The News Agency of Nigeria (NAN) reports that voting commenced at the polling unit at 10. 34 a.m. due to late arrival of officials of the Independent National Electoral Commission(INEC). Osinbajo, who arrived the unit at 10.28 a.m. voted at 10.53a.m. Voting is yet to commence at polling unit 003A at Igando, Alimosho, Lagos as at 11.58am. When THISDAY sought to know the reason for the delay, officials of the Independent National Electoral Commission (INEC) and NYSC members said the card readers were malfunctioning and that they were awaiting the arrival of the supervisor of the polling unit. The voters who had been waiting since 8am, insisted that the electoral officials would not leave the polling unit unless they vote. “The officials are suggesting we vote manually, but no election will hold here without the card readers,”Chidi Oriaku, one of the registered voters at the polling unit said. 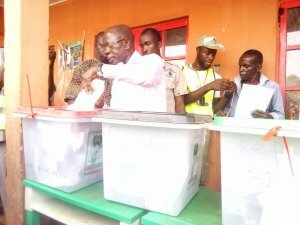 The Nasarawa State Governor Umaru Tanko Al-Makura cast his vote at 11:08am at his Kofar Wambai polling office unit (PU004) of Gayam Ward, Lafia Local Government Area. The governor, who came to the polling unit alongside the North-central zone National Vice-Chairman of the All Progressives Congress (APC) Suleiman Wambai, expressed his satisfaction with the level of the electoral process. Al-Makura also commended the security men at the polling unit, saying he was optimistic that the exercise will be hitch free devoid of violence, adding that the state would maintain its status of non-violence during the elections. Late arrival of voting materials, absence of INEC officials and voters inability to locate their centres were some of the challenges faced at Mararaba, a town on the outskirt of the Federal Capital Territory. Mararaba, a town in Nasarawa state with a large population, is adjudged to be the highest in terms of tax payment in the entire state. Voters who spoke with THISDAY, claimed they had been at the Assignment Primary School, Ward 007 since 7am and as at 11: 35am, only some voting materials which arrived at 9:47 were seen being watched over by ad-hoc staff comprising of youth corps members. At Gbagalape, Ward 021, the same challenges were recorded as youth corps members, security personnel comprising the Nigeria Security and Civil Defence Corps (NSCDC) and the Nigeria Police were positioned close to the voting materials while voting was yet to start as at 11am. One of the ad-hoc staff, who preferred to remain anonymous, blamed the late arrival of materials and INEC staff on logistics. The voters who had vowed to protect their votes were seen queuing up and waiting, but complaining about the delay which some claimed was a ploy to disenfranchise them. 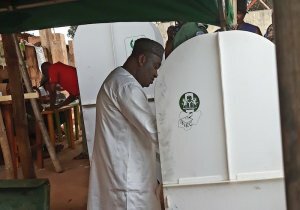 The Director-General of the Peoples Democratic Party Governorship Campaign, Sulaiman Abubakar, on arrival at the polling units in Ode-Opobiyi, Ajikobi Ward, Ilorin West of Kwara State on Saturday decried the late arrival of the Independent National Electoral Commission (INEC) officials at some polling units in the state. Also, there were concerns over the mix up in the distribution of ballot papers to some wards in Ilorin West local government council area of the state. According to reports, some voters could not be able to vote in some wards due to the development. For example, ballot papers meant for voters at Alanamu Ward were found at Ajikobi, some for Ubandanwaki were taken to Adewole ward. Even, some ballot papers that were supposed to be 140 ballot papers in the booklet were discovered to be 70 ballot papers. However, Professor Abubakar said that,”One thing is very clear that we are starting late and we are having technical glitches with the card readers. I want to believe that the INEC staff will be on top of this and hasten the process so we can commence voting”. Abubakar also commented on the peaceful conduct of the voters so far experienced in Ilorin. 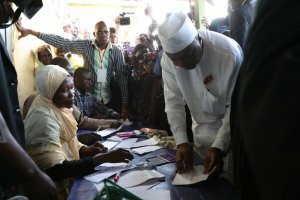 The Speaker of the House of Representatives and candidate of the Peoples Democratic Party (PDP) for Dass, Bogoro and Tafawa Balewa Federal constituency, Hon Yakubu Dogara, has described the large turnout of voters as impressive, saying the election process was “fairly okay, and a bit smooth”. 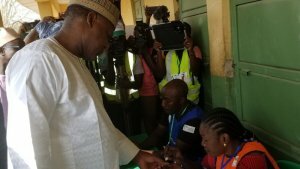 Dogara, who cast his ballot alongside his wife at his hometown in Bogoro, headquarters of Bogoro Local Government Area of Bauchi State at about 9.47am, also lamented the failure of the card reader to automatically authenticate him. Earlier, a large turnout of voters in Bauchi State was recorded in several polling units across the state. THISDAY checks revealed that hundreds of voters including women were seen standing orderly in the queue eagerly waiting for the commencement of the exercise as INEC officials were seen sorting out voting materials. Though voting has not commenced at the crowded Habilla Zaki polling unit in Birshi Miri ward in Bauchi Local Government, voters came as early as 4:00 am to be in the front. One of the voters, Dorcas John, at the Habilla John, told THISDAY that she came out at 4am to cast her vote. She said despite coming out that early, she still met about 30 others on the queue. At Bauchi Club Unit 2 in the state capital, policemen were seen inside the polling unit contravening the 200 meters rules as they were seen chatting with voters as the electoral officers set cubicles for voting. Meanwhile, it was nightmare for some journalists covering the elections along the Bauchi-Tafawa Balewa road when armed soldiers harassed them in the course of carrying out their duties. The nasty experience first started at Dass Local Government when a fierce looking officer, Lieutenant Y Ahmed, stopped a correspondent chapel bus conveying journalists on election duty. The problem started when one of the journalists explained that they were journalists on election duty. This innocent introduction did not go down well with the officer who barked ‘park! park! as his subordinates join the fray to query the journalists. “Are you more special than us? If you are on election duty and so what? Park my friend. See my name. You want to see my name? Whoever you want to call call,” he said. It took the intervention of the Chairman of the Correspondent’s Chapel, Mr Segun Awofadeji, who was leading the team, to calm the situation after calmly explaining the mission as the Lieutenant became sober. There was high turnout of voters in most polling units in Ebonyi State with pockets of malfunctioning card readers. As early as 8am, voters had trooped out to the polling units waiting for the arrival of materials and INEC officials to begin accreditation. In most of the polling units visited, there was no record of violence as the election was peaceful and orderly and security operatives were present. However, in Amagu Inyigba polling unit 007, the malfunctioning of the card readers delayed the accreditation of voters. A Peoples Democratic Party (PDP) candidate for Abakaliki/Izzi federal constituency, Hon. Sylvester Ogbaga, complained that they lost one hour trying to fix the card readers. At Amaezekwe polling unit in Ezza South, there were initial hitches with the card readers, said to have been caused by lack of technical know-how by the operators. The development also hampered the speedy accreditation of the massive crowd at the polling unit. At Ishieke Uburu polling unit 004, the card readers malfunctioned, heightening tension on when it would be rectified to attend to the crowd. A voter at Igweferi 008 polling unit in Akofia ward, Ezza South Local Government Area, Mr. Fidelis Nweze, noted that though there were high turnout of voters, the card readers were not completely functional. Nweze also noted that though the matter had been reported to INEC for possible replacement, he pleaded with the commssion to extend the time allotted for accreditation and voting to enable people who had difficulties with the accreditation to vote. He however commeded the electoral body for the smooth conduct of the election but appealed that some of the hitches witnessed on the functionality of the card readers should be addressed before the next election. At Opi Agu, Nsukka local government area of Enugu state, Corper members and other Electoral Officers being conveyed to a Polling Booth on motorbikes. They complained that vehicles were not provided. Following the replacement of the malfunctioning card reader by the Independent National Electoral Commission (INEC) personnel, the Governor of Kogi State, Alhaji Yahaya Bello, was able to cast his vote in his polling unit at Agasa in Okene Local Government council. The Unit 11 where the governor cast his vote comprises Upokoro-Agasa ward. Before he finally cast his vote alongside his wife, Hajia Rashida, the card reader was bad and it took INEC an hour to replaced it before he could vote. He however expressed the hope that his was an isolated case. “I am disappointed at INEC, and I hope my own is an isolated case,” he said. However, there is large turnout of voters for the election. In most of the polling units visited by THISDAY, people were seen on queues and after accreditation voted. In most of the polling units, there were no security agents. However, in Ihima, where the senatorial candidate of the Social Democratic Party (SDP), Mr Natasha Akpoti, comes from, people came out to vote, with security agents flooding the area. In Lokoja, the situation was calm, people came out to vote just like other places. A high turnout of voters in Bukuru metropolis of Jos South Local Government Area of Plateau State has overwhelmed the Independent National Electoral Commission (INEC) personnel, whose materials were inadequate to meet the needs of the voters. When THISDAY visited the commission’s RAC at Islamia Primary School, Bukuru, the corps members who were supposed to move materials to polling units in Bukuru could not do so because there were inadequate markers to be used. The Peoples Democratic Party (PDP) agent on ground refused the use of biro in place of markers. She argued that biro marks could easily be erased and the voter could come back to vote again. She also complained that some of the result sheets she sighted were fake. As at 10:54 am, voting had not commenced in the various polling units in Bukuru metropolis because the various agents are refusing the use of biro in the place of markers. Some domestic observers have expressed concern over lateness in the arrival of sensitive materials and electoral officers at polling unit 006 as at 9.30 a.m. in Karu, Nasarawa State. A News Agency of Nigeria (NAN) correspondent reports that many voters arrive at the polling unit as early as 6.20 a.m. and still waiting as at press time and becoming agitated. He said “as a matter of fact, I doubt if the school compound can accommodate the number of voters. It is 7.30 a.m. and there is no shadow of any INEC officials, ad hoc staff or party agents here. 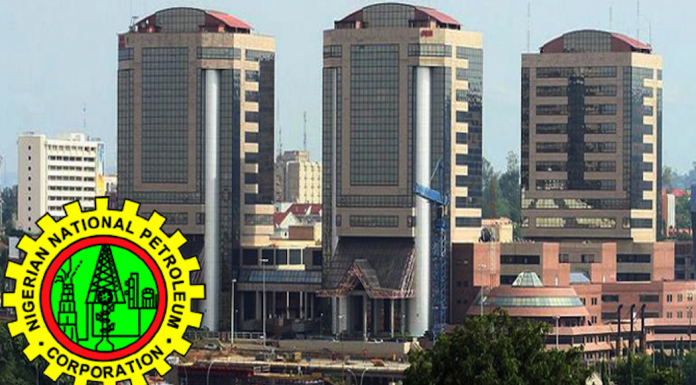 “The only people that reported early here are the civil defence officials,” Ohuakanwa said. He could not understand the delay and hopes the election would eventually hold in the unit. said the electoral officers were late for about an hour. According to him, the lateness will discourage some voters as most of them want to vote and go back to their houses. Development, was impressed at the turnout of voters but worried at the lateness of the INEC officials. he would not be discouraged but would wait for as long as it would be possible for him to cast his vote. Law enforcement officers could not be reached to ascertain what the issue was with unit 006, Karu ward. At Port Harcourt Ward 12, Unit 8, Rumuwoji (Mile 1), voting started by 9.50am. At the RAC Centre located at Township School, Moscow Road, which covers Wards 5, 6 and 7 of Port Harcourt City Local Government Area, materials were yet to arrive as at 9.30am. Reports from across the state indicate that the election so far has been peaceful. There is heavy security presence in Port Harcourt and environs. There was a mild drama at the Stadium Roundabout, Kaduna, when soldiers attempted to stop people from accessing their polling units. The soldiers had prevented residents of the southern part of Kaduna metropolis whose polling units are in various places at the city centre. 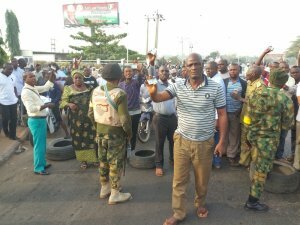 The soldiers, who mounted a road block at the roundabout, had stopped people from driving to the city centre, where their polling units are located, saying that they had orders from above not to allow any movement. Displaying their permanent voter cards (PVCs), the stranded voters who started chanting “Buhari Must Go” insisted that nobody will stop them from accessing their polling units. The soldiers also attempted to seize mobile phones from journalists who were taking pictures of the incident, but the journalists stood their ground, insisting that they were performing their constitutional duties like the soldiers as well. The intervention of a senior army officer avert the situation which would have been chaotic. The officer ordered that all those with their PVCs should be allowed to pass. 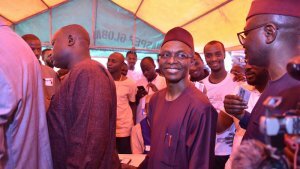 Meanwhile, Governor Nasir el-Rufai and the Commandant of the Nigerian Defence Academy (NDA), Maj. Gen. Adeniyi Oyebade, queued among hundreds of voters in their polling unit 024, Runka/Marnona opposite NDA, Anguwan Sarki, Kaduna North Local Government Area. Residents of Kaduna south, protesting against being prevented by soldiers from accessing their polling units in Kaduna metropolis. 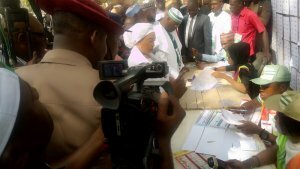 Presidential Candidate of the PDP, former Vice President Atiku Abubakar, and his Wife, Titi, voted at Ajiya 012 polling unit in Yola, Adamawa State capital at about 10:07 am. Five journalists from major national dailies have been arrested by a team of fully armed police officers close to the home of the vice-presidential candidate of the Peoples Democratic Party (PDP), Mr Peter Obi. The police officers, who came in five unmarked police vans, fully loaded and armed, trailed the journalists from the home of the vice-presidential candidate where they covered him while voting. The police officers, who refused to identify themselves, simply blocked the vehicle used by the journalists, ordering them out and collecting the key to their vehicles, before releasing them and driving off with the keys, leaving the journalists stranded. The journalists, Mr Nwanosike Onu of The Nation, Geoffrey Anyanwu of Sun, David-Chyddy Eleke of THISDAY, Vincent Ujumadu of Vanguard and Tony Okafor of Punch were denied the opportunity to even introduce themselves, despite wearing INEC apron, provided for journalists. One of the officers simply told the journalists that they acted on instruction, and would not listen to anyone, not even journalists on duty. THISDAY gathered that the officers, who were more than 50 in number, were on a coordinated operation to ensure that election coverage in the stronghold of the PDP in the state was characterised with fear. The Anambra State police spokesman, SP Haruna Mohammed, who was contacted by the stranded journalists, promised to help retrieve the vehicle keys, while also promising to reach out to the stranded journalists who are helpless at Ogbu junction in Agulu, Anaocha Local Government Area. Shortly after the incident, one of the trucks returned and requested to take away the driver of the vehicle, but the journalists resisted the arrest, causing the team to drive away. As at the time of filling this report, the journalists are still stranded at Agulu. Voting was yet to state at polling unit 001 Dutse Alhaji, FCT, as at 9:30am. Corp members sent to polling unit 002A could not locate their voting points. They said the large crowd there was beginning to get agitated so they had to leave and come back to Rac centre LEA Primary school Dutse Alhaji. In Wuse, election started late by 9.30am and 9.19am at Polling Units 18 and 19 Wuse 2 respectively. At Polling Unit 18, the Polling Officer complained of predominant card reader malfunction, and disorderly conduct of voters. As at the time of filing this report, officials of INEC were seen sorting out the card reader issues and they told THISDAY the challenge will be sorted out for voting to take place. Voting commenced as soon as officials sorted out the card reader issues. At Polling Unit 19, the Polling Officer stated that they were early to the unit but had no chairs and tables to work with, hence, the late commencement of voting. The process was however orderly and voting commenced as at the time of filing this report. Voters’ turnout was equally impressive at both units. The Peoples Democratic Party (PDP) Vice Presidential candidate, Mr. Peter Obi, has described the process of the ongoing Presidential and National Assembly elections as clumsy. Giving his verdict after casting his vote, Obi said it took quite a while before he could vote, though he was number two on the queue. Apparently, the delay was caused by a malfunctioning Card Reader. 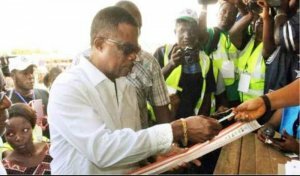 The former Governor of Anambra State disclosed that the Card Reader had to be worked on before it came alive. He added that if many Nigerians had to go through a similar experience, then it was worrisome. Today’s presidential election commenced peaceful in Kubwa, Bwari Area Council in the Federal Capital Territory in Abuja with large turnout of voters at various polling units. THISDAY monitoring crew which visited most of polling units early in the morning confirmed that the INEC officials and the Youth Corp members serving as ad hoc staff arrived on time with voting materials. The first polling unit visited by THISDAY was 0012 at Phase 4 where the officials were seen putting things in order to commence voting as at 8.10am. At the polling unit 009, in Phase 3, which had three voting points, voters came out in large numbers eagerly checking out their names to start voting. The materials arrived at 8.15 am. Also at polling unit 004 in PW-Kubwa,_accreditation and voting began in earnest as at about 8.20 am. The same goes for polling unit 003 which recorded a very large turnout of voters. Voting started by 8.20 am. Similarly at another polling unit at Kubwa Village market area, 006, thousands of voters were seen filing out to cast their votes. In all the polling units so far visited by THISDAY in Kubwa, the people conducted themselves peacefully without any incident. 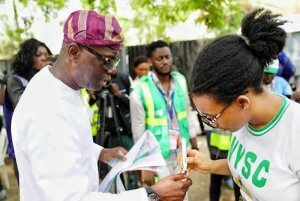 Some voters who rose up early to cast their votes at several polling units in Lagos had to wait for the arrival of Independent National Electoral Commission (INEC) officials as polls opened in the country at 8.00 a.m. In Epe, few voters at the Ogunmodede Junior and Senior College in Papa Epe, Epe, where Gov. Akinwunmi Ambode of Lagos State is expected to vote, were still awaiting INEC officials as at 8.21 a.m.
Few security officials were also on ground at the school. 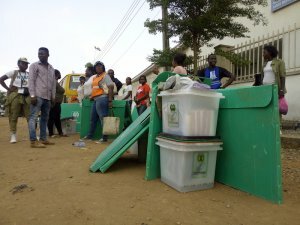 In Ebute-Meta West, some voters who arrived early complained about INEC officials’ absence at Apapa Road Ward 004a and 004b, Elena Primary School. As at 8:25 a.m, voters continued to hang around the Ebute-Meta West ward for the election which was supposed to kick off by 8:00 a.m. Eligible voters in Badagry, a coastal town in Lagos State, besieged different voting units as early as 7:00 a.m. awaiting the arrival of Independent National Electoral Commission official to conduct election. The News Agency of Nigeria (NAN) reports that there were more than 300 voters at the Ansar-Udeen Grammar School, Badagry for polling units 03 and 04, waiting for INEC officials. As at 8:20 a.m., the situation was the same at Badagry Grammar School, which would serve as one of the collation centres, as well as polling units 01 and 02, where the officials of INEC were seen waiting endlessly for vehicles to take them to different polling units. One of the polling officers told NAN that they slept in the school so that they could get to their destinations on time. According to her, we are still waiting for the vehicles that will convey us to our polling units. Meanwhile, INEC officials have arrived Ikoga, Igborosun, Pota polling units as early 8:04 a.m. and the voting process has commenced. Mr Tunji Akande, a voter at Badagry Grammar School said it was sad that when voters left their homes as early as 6:00 a.m. and walked to the polling station, they had to wait till 9:00 a.m. for INEC officials. “This is unfortunate; we learnt the election will start by 8:00 a.m. but unfortunately, nothing is happening here,” he said. NAN reports that the bus conveying the officials arrived at 8:42 a.m. and carried the stranded INEC officials to their duty posts. Accreditation and voting were yet to commence at Polling Unit 009 at Daura Road/Ashanti/Randle Roads in Apapa, as of 8.45 a.m. The News Agency of Nigeria(NAN) reports that the governorship candidate of the Peoples Democratic Party (PDP), Mr Jimi Agbaje, is expected to vote at the polling unit. NAN reports voters as many as 50 were seen on the queue, waiting for the commencement of the process. Though electoral officers arrived the polling units with materials on time, they spent much time pasting voter registers and making other preparations for the process. The situation at the polling unit, however, remained calm as voters were orderly and security men were around to check any breach of peace. The situation was the same at polling unit 1, Modiq /Fagbayi/Queens Barracks in Apapa as the process commenced. Unlike at Agbaje’s polling unit, where there was a long queue of voters waiting, the electoral officers were the ones waiting for voters. As of 9:00 a.m., a couple of voters were seen arriving at the polling unit to partake in the process. Late arrival of election materials at most of the polling centres delayed the commencement of voting in Tarauni and Nasarawa local government areas of Kano state on Saturday. A Correspondent of the News Agency of Nigeria (NAN) who monitored the election reports that while security personnel and the electorate arrived at the polling centres as early as 7:00 a.m., INEC officials failed to show up with the election materials. At Tarauni Asibiti polling centre, security agents and voters were seen awaiting the arrival of materials and INEC officials. One of the voters who spoke to NAN said he came to centre around 7:56 a.m. with the hope meeting the electoral officers but was disappointed. Similarly, at Garden polling centre, the story was the same as there was no single INEC official while only voters and security agents were seen waiting for the arrival of the election materials and officials. When NAN visited the Garden Collation Centre around 8:00 a.m., the election materials were being distributed to various polling centres, while security personnel kept vigil there. At Gyadi-gyadi Arewa polling centre, located at the Women’s Centre, the materials and election officials were already on ground as at 8:15 a.m. trying to sort things out. At Magwan polling centre within the Giginyu Ward in the Nasarawa local government area, the materials and INEC officials were nowhere to be found as only security agents and voters awaited the arrival of materials as at 8:30 a.m.
NAN observed that the turnout of voters, especially men, was impressive at most of the polling centres visited in the two local government areas. Electoral officers in Karu, Abuja Municipal Area Council (AMAC) of the Federal Capital Territory (FCT) are currently striving hard to control a large crowd of voters in polling units. In Unit 010, near Area Court for instance, the turn-out is overwhelming. However, up to the time of filing this report at about 9.20am, accreditation is yet to begin as the electoral officers are still making arrangements for the take-off of the accreditation process. But voters who queue up in aphabetical order of their names are calm and patient, eagerly waiting to cast their votes. However, the turnout at CBN Quaters, another part of Karu is even larger, thus proving wrong the assumptions that turnout will be low today as a result of the postponement of the election last weekend. 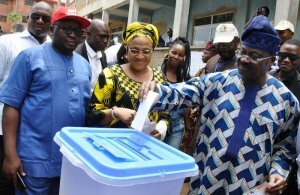 The vice-presidential candidate of the Peoples Democratic Party (PDP), Mr Peter Obi, and his wife Margaret have cast their votes in the presidential and National Assembly elections. Obi cast his vote at exactly 8:55am at his Amatutu Village polling unit, Agulu ward 2, in Anaocha Local Government area of Anambra State. 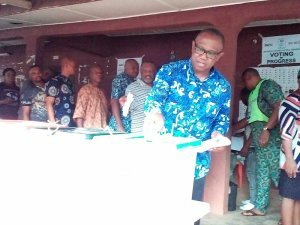 Speaking to journalists after casting his ballot, Obi said it was too early to confirm that the process was going smoothly, but promised to confirm so later in the day after reaching out to voters in other parts of the country. Obi however revealed that security agents Friday night went after some known PDP stalwarts in the state. He told journalists that he was also harassed by security agents but refused to say more about it. “The answer to your question is capital yes. Most of our members, including myself were harassed by security agents last night,” Obi said. THISDAY gathered that some PDP stalwarts in Anambra had been arrested late Friday night by security agents. Some of those said to have been visited include Mr Joe Martin Uzodike, a known ally of Peter Obi, and another, Jeff Ezeukwu in Alor community of Anambra State, the hometown of the Minister of Labour and employment, Dr Chris Ngige. There were high turnout of voters in Ekiti State in the presidential and National Assembly elections. The security arrangements were such that four policemen guarded each of the polling units. As early as 8am, virtually all the polling units in the state capital witnessed heavy clusters of voters, while the Independent National Electoral Commission (INEC) staff came as early as 8am to attend to the people. Most of them trekked several kilometres to get to their polling units due to the restrictions placed on vehicles. The state police commissioner, Mr Asuquo Amba, lauded the process, particularly the large turnout of voters. He said his men and officers are all over Ekiti to ensure that sanity prevails. “Our men are all over the place and we are getting favourable feedbacks across the state. We are on ground and all the voters and INEC staff including election materials are safe,” he said. 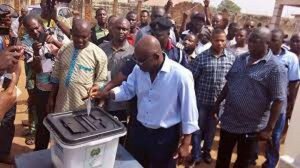 Also, a presidential aide, Senator Babafemi Ojudu, after voting at Adeyinka Jimba unit 009B at Ward 8 in Ado Ekiti, applauded INEC and security agencies for their peaceful conduct. Ojudu, who is the Special Adviser to the President on Political Matters, added that the level of credibility of the polls will be high if the situation in Ekiti persist all over the country. Virtually all the ad hoc staff and election materials meant for the conduct of the presidential and National Assembly elections were yet to arrive in most of the polling units in Lafia, the Nasarawa State capital, as at 9am. A visit by THISDAY to the Kofar Wambai Polling Unit (PU 004) of Gayam Ward (RA 08) in Lafia Local Government Area of Nasarawa State showed that voters had turned out in large numbers to exercise their civic responsibility only to discover that the election officials and voting materials were yet to arrive the polling unit. An observer, who spoke to THISDAY, said that in most of the polling units she visited, neither the ad hoc staff nor election materials were around. Security was poor in most of the polling units visited particularly at the Kofar Wambai Polling Unit, which is the Al-Makura’s voting centre where a police officer was stationed to provide security to the over 500 voters. Voters in Lafia, Nasarawa State are in high spirit to cast their votes in the rescheduled Presidential and National assembly elections. The News Agency of Nigeria (NAN) reports that most voters came to their various polling unit within the metropolis as early as 7:00am to queue and wait for electoral officials. 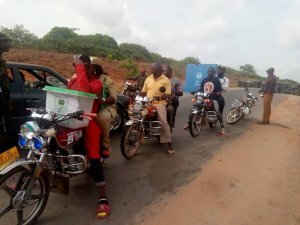 At Bukan-sidi polling units, voters were seen anxiously waiting with some gathered in clusters with security agents on ground to ensure a smooth exercise. Dr Blaise Okwaraoha, a voter at Bukan-sidi polling unit 17, said he came out before 7:00am to queue and perform his civic responsibility early. Okwaraoha said he was enthusiastic to cast his vote because he believed his vote would count. He expressed doubt the postponement of the election last week would affect the voter turnout as most voters had put the incident behind them. Similar enthusiasm is observed at Ungwan-mangu policing unit of Akurba ward, Lafia-East primary school in Ciroma ward as well as Lukumanu polling unit at Makama ward. As Nigeria go to the polls to elect their leaders who will pilot their affairs for the next four years voters in Sokoto State have come out early en masse to queue awaiting the voting time. THISDAY, which visited some polling units within Sokoto metropolis, witness massive turnout of voters. Some voters kept vigil at the polling units awaiting daybreak to cast their votes. The Independent National Electoral Commission (INEC) personnel reported as early as 7:am. Today’s election kicked off in Osogbo smoothly with massive turnout of voters amid tight security. Election materials and officials also arrived early in polling units visited by our correspondent, while accreditation and voting commenced as scheduled. 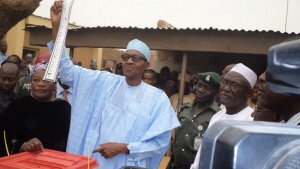 President Muhammadu Buhari has cast his vote in his Daura, country home. 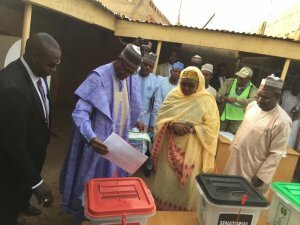 The president who arrived the polling booth along with his wife, Aisha, cast his vote at exactly 8.07am after going through the initial accreditation at 8.04 am. Buhari voted about two minutes after his wife, Aisha, had earlier voted at about 8.05am. The president who was accompanied to the polling booth by his security aides later answered questions from journalists, commending the process, saying it had been smooth. Asked if he would concede defeat if he lost the election, Buhari said he knew he would be congratulating himself after the poll because he was sure of victory. 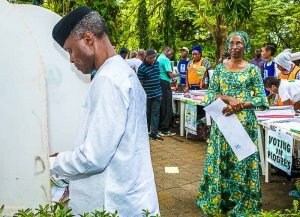 Vice President Yemi Osinbajo and his wife, Dolapo Osinbajo, will exercise their franchise in the 2019 presidential election at the Victoria Garden City (VGC), Lagos on Saturday.